La Cumbre volcano on Fernandina Island on Saturday began spewing smoke and gas into the air with lava flowing into the sea, the Galapagos National Park (PNG) said. The uninhabited Fernandina is the most volcanically active island in the Galapagos archipelago. La Cumbre had previously erupted in May 2005. PNG does not expect the eruption to affect people living on nearby Isabela Island, the largest in the archipelago (see map below). Aerial photo of the eruption of the La Cumbre volcano in Fernandina island, Galapagos Archipelago, Ecuador dated April 11, 2009. It’s feared that the eruption could affect the archipelagos fauna, which was declared a UNESCO World Heritage Site in 1978, the Galapagos National Park (PNG) said. Photo: PNG. 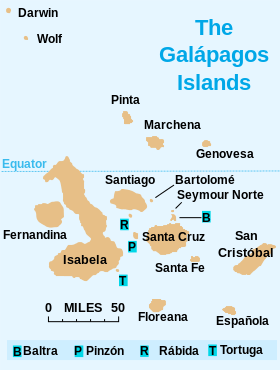 The Galapagos archipelago were added to the list of endangered world heritage in 2007 mainly because of the threat from tourism. Dust clouds rise from Fernandina [syn: La Cumbre] caldera on July 4, 1968, about three weeks after a major explosive eruption that was followed by collapse of the caldera floor. Collapse occurred incrementally and asymmetrically, ranging up to about 350 m at the SE end of the caldera, which contains the caldera lake. Fernandina, the most active of Galápagos volcanoes and the one closest to the Galápagos mantle plume, is a basaltic shield volcano with a deep 5 x 6.5 km summit caldera. The volcano displays the classic “overturned soup bowl” profile of Galápagos shield volcanoes. Its caldera is elongated in a NW-SE direction and formed during several episodes of collapse. Circumferential fissures surround the caldera and were instrumental in growth of the volcano. Reporting has been poor in this uninhabited western end of the archipelago, and even a 1981 eruption was not witnessed at the time. In 1968 the caldera floor dropped 350 m following a major explosive eruption. Subsequent eruptions, mostly from vents located on or near the caldera boundary faults, have produced lava flows inside the caldera as well as those in 1995 that reached the coast from a SW-flank vent. Collapse of a nearly 1 cu km section of the east caldera wall during an eruption in 1988 produced a debris-avalanche deposit that covered much of the caldera floor and absorbed the caldera lake. Photo by Tom Simkin, 1968 (Smithsonian Institution). Caption: GVP. Lava fountains from Fernandina volcano in the Galápagos Islands feed digitate lobes of lava in 1978 that travel across a down-dropped block of the NW caldera bench, about 380 m below the caldera rim. The 1978 eruption began on August 8, when a 6-km-high eruption cloud was visible from distant locations in the archipelago, and apparently ended on August 26. During the course of the eruption lava flows traveled 2 km into the caldera lake, more than 400 m below. Photo by Marc Orbach, 1978 (courtesy of Tom Simkin, Smithsonian Institution). Caption: GVP. This entry was posted on April 12, 2009 at 1:11 pm	and is filed under Charles Darwin, ecuador, Galapagos tortoise, iguanas, UNESCO World Heritage. Tagged: Fernandina Island, Galapagos Islands, Galapagos National Park, Isabela Island, La Cumbre Volcano. You can follow any responses to this entry through the RSS 2.0 feed. You can leave a response, or trackback from your own site. A volcano in the Galapagos Islands has rumbled into life again a week after it erupted. The Geophysical Institute of the National Polytechnic School reported 43 thermal alerts and said that satellite images revealed a column of gas that extended more than 60 miles (100 kilometres) west of the islands, indicating an increase in volcanic activity. The La Cumbre volcano began spewing lava, gas and smoke on Fernandina Island on Saturday after four years of inactivity. Experts are concerned the activity may be taking a toll on the islands’ famed wildlife and will launch a study on the environmental impact of the volcano in the coming days. Charles Darwin developed his theory of evolution after studying the unique animal populations of the Galapagos Islands – and they have attracted biologists and conservationists ever since. The islands are scarcely populated, but the United Nations last year said the pristine environment of the Pacific island chain was in danger due to booming tourism. Two satellite images were added to the post today. I’m doing a Spanish current Event project and i have decided to do it on this eruption if anyone knows where I can get more Information, Advice is welcome.